Rolling medium-length, layered hair on hot rollers results in a headful of soft, stylish waves or curls, depending on the size of the rollers used (the smaller the roller, the tighter the curl). 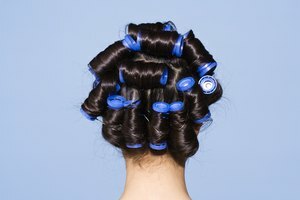 Setting your hair on rollers may take some practice--especially rolling the back, which is more difficult to reach and see--but practice makes perfect. 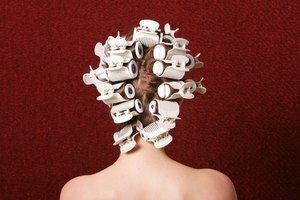 Plug in your hot rollers. Ensure that your hair is completely dry. Give your hair a light coating of hair spray. Using a comb, make two parts down the back of your head--equidistant from the center to form a section the same width as your rollers--from the crown to the neckline. Use the comb to draw a horizontal line, separating the top, or shortest, layer of hair from the longer layers underneath. Comb this section of hair up and out, holding it away from your head. Place a hot roller on the bottom side of the hair at the tips, and roll the curler under until it touches the scalp. Secure the roller with a clip or other fastener provided with your set of rollers. Part off the next layer of hair in the back, directly beneath the previously rolled section. Repeat Step 4 with this section, inserting another roller. 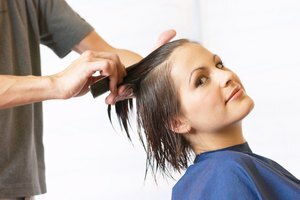 Continue down the back of your head, using a separate roller for each length of hair, or layer. If your hair has many different lengths, you can combine similar lengths into one roller. Typically three to four rollers are used down the back of the head. Make a vertical part the width of a roller away from the already rolled back section, on one side of your head (to either the left or right of the back center section). Follow steps 3 to 5 to divide this section horizontally into three to four smaller sections, rolling each on a hot roller. Do the same on the opposite side of the back center rollers, so you now have three columns of rollers, each with three to four rollers. Roll the front hair on each side in two more columns, following steps 3 to 5. When all of your hair is rolled, lightly coat it again with hair spray. Allow rollers to cool completely, which typically takes from 10 to 30 minutes. Remove rollers, shake head and finger-style curls as desired. 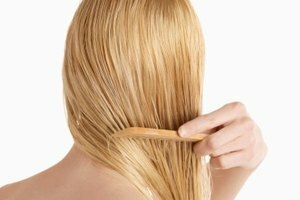 Lightly brush your hair, if desired, but be aware that this has a tendency to remove the curl and straighten the hair. Use a hand mirror to check your handiwork on the back of your head and to make sure hair is smoothly wrapped around the rollers and that they're in relatively straight rows and positioned horizontally. The higher toward the ceiling you lift each section of hair before inserting a roller, the more volume you'll build into your hair.